In the case of “Study for a Tree,” a leafless tree grows tall and a bicycle attached to the small version of the tree rises above the ground as the tree grows. A more complex version of this technique can be found in the current exhibition, Local Flora, at SAW Gallery. Morrow’s work is head and shoulders above his colleagues at Rectory Art House. 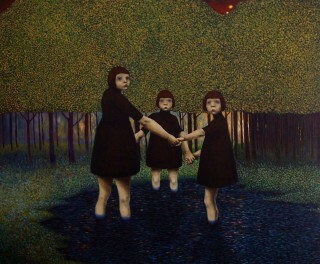 There are 10 artists who are or were at the Rectory showing at the exhibition, which is also called Backstories. Morrow and Karen Bailey are probably two of the best-known artists at the Rectory. One hopes the exhibition and small catalogue will increase the visibility of some of the other artists. 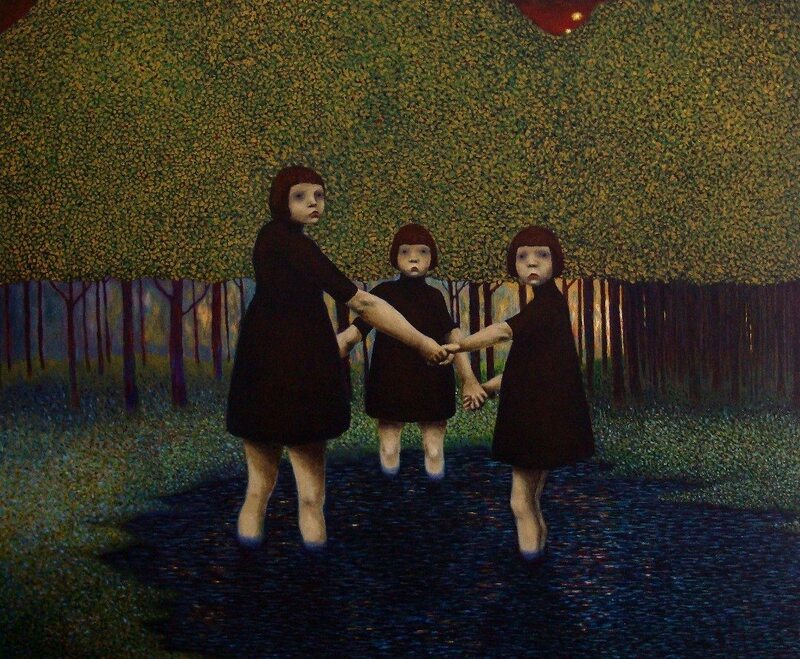 I was particularly intrigued by some of the acrylic paintings of Sharon Lafferty, my favourite being “There Were Three,” a scene in which three girls, standing in a pond or large puddle, hold hands to form a circle. They stare directly at you, the viewer. Exactly. I was one of those people who found the kids somewhat creepy. But after reading Lafferty’s comments, I realized the enigmatic expression on their faces could be interpreted in many different ways. That realization made me love the painting even more. The other featured artists are Elle Chae, Krisha Dayola, Carolyn Frank, Andrea Mueller, Corinne Nieuwburg, Karen Rasmussen, and Lori Victor. The exhibition was curated by Jaenine Parkinson, programs manager at St. Brigid’s. The quality of the work varies widely. But chances are you will find something to love. The show runs until July 24 and is open weekdays from 11:30 a.m. to 5:30 p.m. and on the weekend from 10 a.m. to 5:30 p.m.